"There are always consequences to your actions." Being a supervisor to 00 agents brings with it a tremendous amount of responsibility. That responsibility includes cleaning up any messes those agents may make. In James Bond: M from Dynamite Entertainment, one of those messes that need cleaning is made by the supervisor himself. The issue is written by Declan Shalvey, illustrated by PJ Holden, colored by Derbhla Kelly and lettered by Simon Bowland. James Bond's superior, code-named M, scrambles MI6's secret agents across the globe. Sometimes, he knowingly sends them to their deaths, for the greater good. But a traumatic event from M's early days in the field returns to haunt him, forcing M to return to the scene of a crime...HIS crime. In the James Bond universe it's generally 007 who gets top-billing, but Shalvey flips things around a bit and focuses on M as he exists in the Dynamite 007 universe. In that regard, M is shown to be a pragmatic yet dangerous individual who knows how to play the spy game as good as 007 himself, even if Shalvey times the one-shot around 005's employ with MI-6. The writing is pretty effective at characterizing M in the aforementioned way, taking him out of his element a bit for a weekend "getaway" to Belfast. Considering the issue is just a one-shot, Shalvey does a great job too of keeping the focus of the issue on track and getting to a satisfying resolution. What's also great is his interactions with Moneypenny whom Shalvey characterizes as fiercely loyal and whip-smart. The illustrative style of Holden is a good fit for the book's theme. Holden renders M as a massive man who prefers the more diplomatic approach that espionage brings with it while at the same time showing the reader his military background and ability to hold his own in combat. The panels are laid out very cleanly, yet Holden does some interesting things here and there in that some of the action isn't confined by a panel. Holden doesn't lose sight of the universe he's dabbling in, infusing the more discrete interactions between contacts with a sense of urgency. Kelly's colors are predominantly darker and seem to evoke the shadows in which most of the players tend to inhabit. 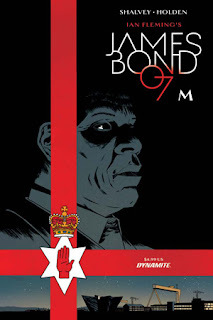 James Bond: M is a very intriguing one-shot that adds a bit more to the James Bond universe without the character even being mentioned once. M is a man who knows how to get things done, drawing upon his military background as a guiding force in his newfound life as head spy. Shalvey's script has a lot of dialogue in it and does a great job of characterizing the lead. Holden's illustrations are a perfect complement for the script in that it convinces the reader that M is the man who should be running MI-6. James Bond: M is a pretty heady take on the character and universe that helps fill in a lot of the gaps. James Bond: M is available now.